An innovative and award winning outboard delivering the ultimate in efficiency and power with Lean Burn control and Suzuki Selective Rotation. Suzuki's Lean Burn Fuel Control Technology predicts fuel needs according to operating conditions, then delivers the optimum fuel/air mixture to the engine resulting in greater fuel economy. Selective rotation offers a more robust gearing in the lower unit enabling the prop to rotate in both directions. This technologically advanced system gives smooth, precise control with crisp, immediate shifting particularly at low revs when manoeuvring and helps improve fuel efficiency. 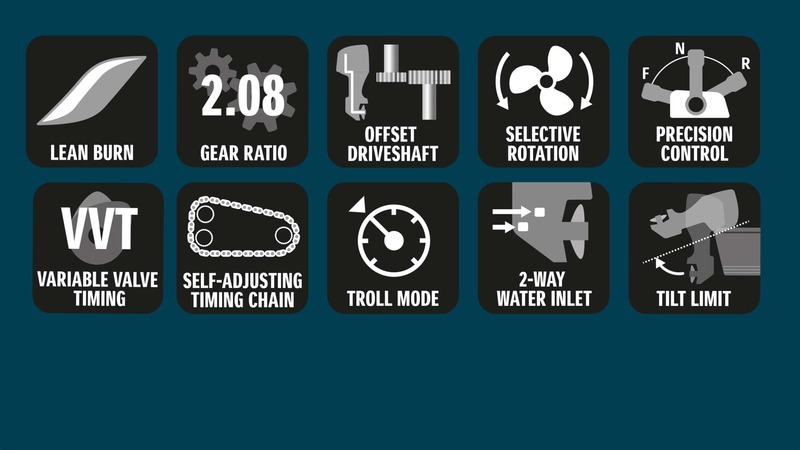 A large reduction gear ratio leads to powerful torque for quick acceleration and great top-end speed. The system is controlled by hydraulic pressure from the oil pump and the process happens automatically so all you have to do is enjoy the power and performance. This intuitive technology allows you to view important information from engine rpm and trim to boat speed and fuel economy, all on one user friendly screen. A stainless steel propeller with a new interchangeable square shaped bush that offers efficient conversion of engine power to propulsion resulting in better grip and performance for our powerful outboards. Propeller Selection (pitch): 15" - 27.5"
Suzuki have won a total of eight National Marine Manufacturers' Association (NMMA) Innovation Awards - more than any other outboard manufacturer. As every engine in our range is designed specifically for the rigours of marine use our 4- Stroke outboards provide quiet, fuel-efficient and reliable technology whilst delivering market-leading power and performance. The first in its class to offer a genuine full-colour display, our Multi-Function Gauge provides all the performance information you need in one easy-to-read gauge. It can be operated with either a digital or analogue readout, and incorporates day and night modes. Individual elements can be enlarged to further enhance user friendliness, functionality and reliability.